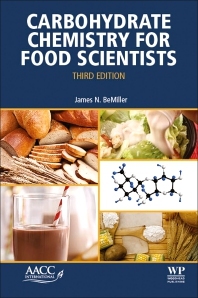 Carbohydrate Chemistry for Food Scientists, Third Edition, is a complete update of the critically acclaimed authoritative carbohydrate reference for food scientists. The new edition is fully revised, expanded and redesigned as an easy-to-read resource for students and professionals who need to understand this specialized area. The new edition provides practical information on the specific uses of carbohydrates, the functionalities delivered by specific carbohydrates, and the process for choosing carbohydrate ingredients for specific product applications. Readers will learn basic and specific applications of food carbohydrate organic and physical chemistry through clearly explained presentations of mono-, oligo-, and polysaccharides and their chemistry. This new edition includes expanded sections on Maillard browning reaction, dietary fiber, fat mimetics, and polyols, in addition to discussions of physical properties, imparted functionalities, and actual applications. Carbohydrate Chemistry for Food Scientists serves as an invaluable resource on the chemistry of food carbohydrates for advanced undergraduate and graduate students, and a concise, user-friendly, applied reference book for food science professionals.